2-Piece Rear Main, Large Journal. This is a STD Size Kit. Oversize piston rings and bearings are available at no extra cost. This kit will not work with the 1986 and later engines due to the metric rings used in those engines. 060 Main bearing sizes available: STD. 020 Rod bearing sizes available: STD. As your number-one source for high performance parts, it only seems right to offer you these Re-Ring kits. They feature brand name components, matched for optimal performance by our experienced techs, so you can get the rebuild components that you need without the guesswork. These affordable kits have been designed to get the maximum performance and reliability out of your engine without breaking the bank. 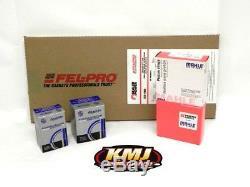 All kits include piston rings manufactured by Mahle, Aluglide bearings manufactured by ACL, and an overhaul gasket set manufactured by Fel-Pro. Don't settle for a lower cost, inferior kit with no-name brands. Do it once and do it right. With KMJ Performance Re-Ring Kits! To prevent any delays with your order you should watch for the following common issues. Addresses that only have a PO Box can cause long delays and almost always result with having to credit/cancel the order in the end. If the ord er requires multiple packages someone will need to sign for each one. Some items are not combined due to size or weight such as crankshafts, torque converters, radiators, cylinder heads, etc. Powered by SixBit's eCommerce Solution. The item "SBC Chevy 350 Complete Re-Ring Rering Overhaul Kit with Bearings Gaskets & Seals" is in sale since Monday, July 18, 2011. This item is in the category "eBay Motors\Parts & Accessories\Car & Truck Parts\Engines & Components\Engine Rebuilding Kits". The seller is "kmjperformance" and is located in Story City, Iowa.